Is Your Business Ready To Run The Race? Seasoned racegoers will know that the winner seldom leads the race from the starting gun. It is the job of the jockey to think strategically. He has to gauge the relative strength of his competitors. He has to take into account the external factors such as the condition of the race track. In business, the business owner performs a similar role. He has to take into account all factors, internal and external, and then create a strategy that will get him first past the winning post. Of course, this does not happen in an instant. Years of breeding and training go into creating a winner. In addition to the horse and jockey, there is always a team of breeders, vets, lorimers, groomers and farriers that focus on preparing the horse for the big race. To create a winner, every one of these people needs to be an expert in their field. Not only must the horse be prepared for the race but the owners, the jockey, the course stewards, the bookmakers, the caterers, the facilities management all have to be up to a high standard to ensure a successful race day. In the same way, business accounting software is just one element in the mix that makes a successful company. A lot of hard work from many people in your team goes into getting all elements to combine and win the race. As you get closer to race day, some decisions need to be made that are going to be critical to your chance of success. There is also a certain sequence in the way things need to be done. In business, the race is a long one, like the Melbourne Cup. 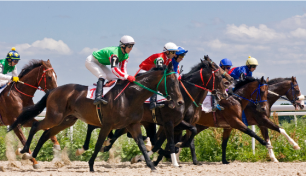 While choosing the winning horse can be left to luck, with business accounting software you can reduce your risk of selecting the wrong horse by getting advice from the experts. You need to prepare your business to make sure it is ready for the software system you select. Simply implementing a new business accounting system on its own will not win you the race. Your company processes, systems, responsibilities, procedures and people all work together to win the race. Business is about competitive advantage and business accounting software is one of the tools you can use to improve this. But you need to know the areas in which you are weaker than your competitors in order to focus on improving these. The first steps in preparing for new business accounting software is the selection of the software itself. Kilimanjaro selected MYOB as their strategic partner in Enterprise solutions. Not only are the solutions localised for the Australia and New Zealand markets, but they are best of the breed. Each business is unique and each software package has a unique set of functionality that suits a particular business. The vendors of the software will know the relative strengths and weaknesses of the software packages they support. As an example, MYOB Exo is extremely strong in inventory based businesses, job costing and integration. It is suitable for bills of materials, but not for complex manufacturing. MYOB Advanced has its major strength in general ledger-centric businesses. The preferred method of deployment is also a consideration. For some businesses software as a service (SASS) is essential while for other businesses this may not be possible. Make sure you talk to a reputable channel partner who will be upfront with you about the strengths and weaknesses of each of their products. Beware of the Tout. The structure of the software also needs to be understood. If your business requires segregation of responsibilities, you need a software package that has been built to enable this. On the other hand, if your business has not yet reached a stage where this is necessary, you will be much better off with a permissions-based structure. MYOB Advanced has been created from the ground up with segregation of responsibilities. Smaller businesses will find this frustrating while larger businesses have this as a basic requirement. Once you have selected the product, the hard work begins. Most implementers will have a structured methodology. This series of steps will comprise a design phase (or discovery phase), a build phase, a user acceptance testing phase, and a go-live phase. Implementers with a track record of success will follow their methodology to reduce risk and to ensure a successful outcome. There is no point in entering a horse into a major race unless it is well prepared, ready and has an equal chance of winning. Our team at Kilimanjaro will not let you go live until we are confident that you are well prepared. We will be there with you every stride of the way. Don’t leave the future of your business to luck. Contact us today.